A blimp hitched to a vehicle and equipped with air quality monitoring equipment floats in the air at the Fengxian Campus of East China University of Science and Technology yesterday. 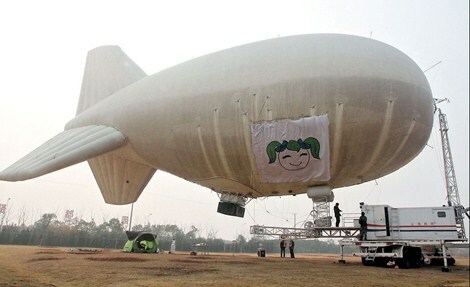 A blimp hitched to a vehicle and equipped with air quality monitoring equipment floats in the air at the Fengxian Campus of East China University of Science and Technology yesterday after the setting up of the high-altitude and stereoscopic environmental observation center. Officials said the airship will collect data from the air such as the readings and distribution of tiny PM2.5 particles at different heights within 1,000 meters. It will provide a reference for the city in its fight against air pollution. The Shanghai Environmental Monitoring Center will keep a record of air pollution data for further analysis that can help the government take measures and adjust policies to combat air pollution.